One of the few benefits of having a blog that very few people read is that I can repeat myself and few, if any, people will notice. 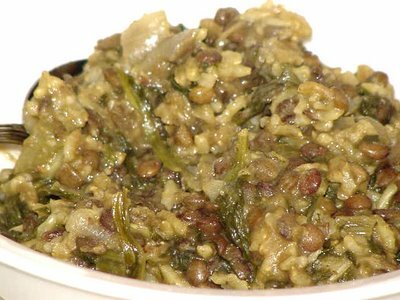 A while back I wrote about this Brown Rice, Lentil and Spinach Curry and posted a picture that, had I been trying, could not have made the finished product look any less appealing. In fact, I guess I could proudly say that it might have been a contender for James Lileks’ Gallery of Regrettable Food, except that it is a current recipe, and not from the ‘50s or ‘60s. But it was good. Really good. The lentils, rice and spinach seem made for each other, and the spices all come together for a satisfying curried flavor. I suppose you could make it easier on yourself by just using your favorite curry powder, but to me there’s something satisfying in pulling out each spice jar and smelling the flavor structure as it builds layer by layer. As I was pulling out the spices, I realized that I did not have any ground coriander on hand. I did, however, have some coriander seeds that I had just bought, so I ground them up. I am quickly becoming a proponent for grinding one's own spices. They are so much stronger, cleaner, and fragrant than anything you can buy pre-ground. They have much more personality and can hold their own when mixed with other spices. Most pre-ground spice mixtures are one-dimensional. No matter how good they taste, they just have the one note. But when you mix freshly ground spices together, each one brings its own strength to the table so that what you taste is the mingling of each fantastic flavor. Have I convinced you? I hope so. I don't know if this picture does more justice to how good this is. Go on. Give it a try and see for yourself. Wash lentils and put them in a saucepan with 1 1/2 cups of water. Bring to a boil. Cover, reduce heat to very low, and cook 20 minutes. Remove from heat until ready to add to the rice. Heat the saute liquid in a large heavy saucepan or Dutch oven. Add onion and celery and cook 5 minutes. Add garlic and cook 3 minutes. Add carrot and chile. Cook, stirring, 1 or 2 minutes. Add ground spices and cook, stirring, about 1 minute. Add rice. Cook, stirring, about 5 minutes, until grains turn translucent, then opaque, but not scorched. Stir in the lentils and any unabsorbed water in the lentil pot. Add salt, pepper, and broth or water. Cook at a low boil for 15 minutes. Add the spinach, pushing it down into the rice mixture. Cover, reduce heat to very low, and cook 30 minutes. In a small skillet or saucepan, cook the cumin seeds until they begin to darken and pop. Pour over the lentil-rice mixture, add the lemon juice, and serve. I have got to say you are dead on with your assessment of that picture. It looks like a colorized monster from a 50s scifi movie. On the other hand the recipe sounds very tasty. I think there was a Monty Python skit about something like that once, an outer space menace that was also quite delicious. Oh yes! It was the dreaded Blanc Mange. I believe they finally destroyed it with a couple of spoons.